Colin John Lawrence joined the Royal Australian Navy in January 1986 as part of the inaugural first year intake into the Australian Defence Force Academy in Canberra. He graduated with a Bachelor Degree of Electrical Engineering in 1989. After completing the Aircraft Engineer Officers Application Course in 1991 he served in a number of roles within the Fleet Air Arm including an exchange with the Australian Army at the 171 Operational Support Squadron in Oakey, the Aircraft Maintenance and Flight Trials Unit in Nowra, the Naval Aircraft Logistics Office in Sydney, 816 Squadron as the Senior Maintenance Manager of the Seahawk helicopter fleet and within the Directorate General of Technical Airworthiness in Melbourne. In 2005 he was appointed as the first military Chief Engineer for Navy Aviation and on promotion to Captain in 2007 was appointed as the inaugural Chief Staff Officer Aviation Engineering in the Fleet Air Arm Headquarters. During his subsequent tenure as the Director of the Navy Aviation Systems Program Office, he was appointed as a Member in the Military Division of the Order of Australia (AM) in the 2012 Australia Day Honours List for his enduring contribution to the Royal Australian Navy’s aviation capability. 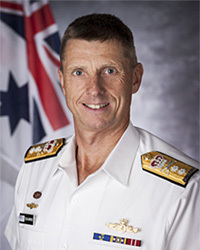 Following promotion to Commodore in September 2012, he was appointed as the Director General Navy Aviation Systems in the Defence Materiel Organisation responsible for the sustainment of all Naval Aviation capabilities and acquisition of the Seahawk Romeo and Helicopter Aircrew Training System. In 2016 he served as Chief of Staff within the Navy Strategic Command. On 5 December 2016 he was promoted to Rear Admiral and appointed Head Navy Engineering which includes oversight of the Navy's seaworthiness management system, engineering policy and Naval Flag administration.